Nave, south aisle and chancel were built between 1325 and 1350, possibly on older foundations. The tower is C15 and the north aisle C19. The chancel windows have C14 wooden hoodmoulds and the fittings are interesting. There was a church here by the late C11, when the advowson belonged to Lewes priory (VCH 7 p132). A C12 cushion capital was found in 1887 in the north nave wall (Meads) and it has been suggested (www.crsbi.ac.uk retrieved on 1/4/2013) that it belonged to a double opening, probably in a tower. This might suggest a considerable church at this time, but nothing is known for certain, though the nave is relatively short and may be built on the foundations of that time (1 p102). The centre of the present village is half a mile away. The nave as it was until 1887 is otherwise mid-C14, as are the gabled south aisle and chancel, all built of the local sandstone. 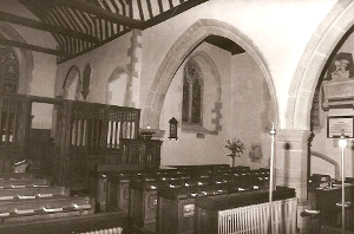 The aisle is much as shown by Nibbs, with a hollow-chamfered doorway and irregular south windows, all of two lights; the pointed south west one has a quatrefoil in its head, and the other is square-headed with ogee-headed lights, whilst the head of the east one is cinquefoiled. The south arcade has two broad bays, with a shallow groove separating the double-chamfered heads. The unusual responds are of semi-octagonal section with an attached shaft each side. The north wall appears to have been all C14, including a three-light square-headed north window seen in the Burrell Collection drawing (1782). 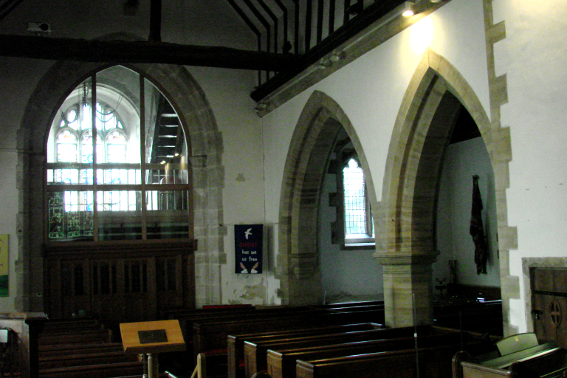 There is no chancel arch and the C15 screen (see below) that had been reinstated here has been removed, though the upper entrance to the rood-stair remains. The roofs are probably also C14, though the nave one with crownposts (lacking in the chancel) could be C15. They retain their Horsham slabs outside. The chancel has C14 side windows with quatrefoil heads and a transomed south lowside. The restored east window, of a type found elsewhere in Sussex, especially its central part, has an elongated oval in the head. The interior hoodmoulds of the side windows are wooden and the lowside and the east window of the south aisle may have been similar (2 p147). However, that of the east window, like the exterior one, is stone with head-stops. There is no sign that the squat tower predates the later C15. It has heavy buttresses and a tower arch with a continuous outer order. 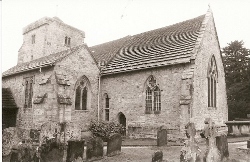 The uncusped bell-openings, the four-centred west window and plain pointed doorway all show the date. 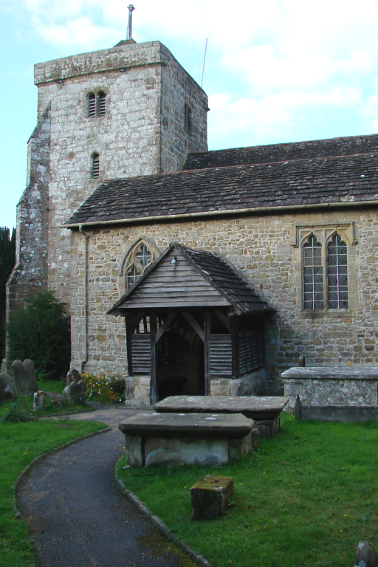 The structure of the timber south porch dates from around 1500, though the boarding is renewed. The only post-Reformation change still apparent is the blocked doorway in the east wall of the south aisle. This gave access to the manorial pew linked to Wakehurst Place (Meads). At a restoration by Sir George G Scott in 1855 (SAC 83 (1943) p143), much of the south arcade pier and the east window were renewed. 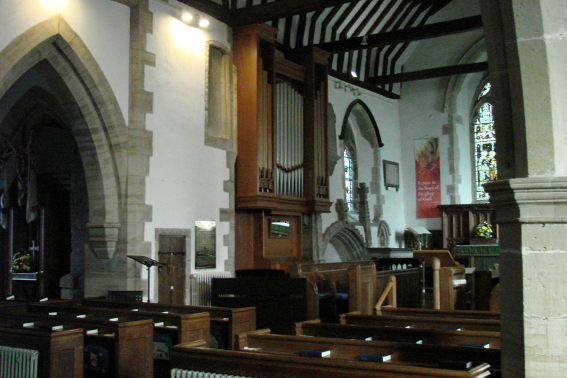 In 1887-88 R H Carpenter and B Ingelow (BE p397) added the north aisle. It resembles the south one, but the arcade is more conventional, though also of two bays. The two-light square-headed west window is formed from parts of the C14 north window of the nave. The organ chamber south of the chancel also dates from this time. The round west window of the south aisle is C19, but of uncertain date. At a restoration by H M Pett in 1926-27 (CDG NS 73 (1927) p19) work included repairs to the roofs (Meads). Altar rails: c1700 with twisted balusters. 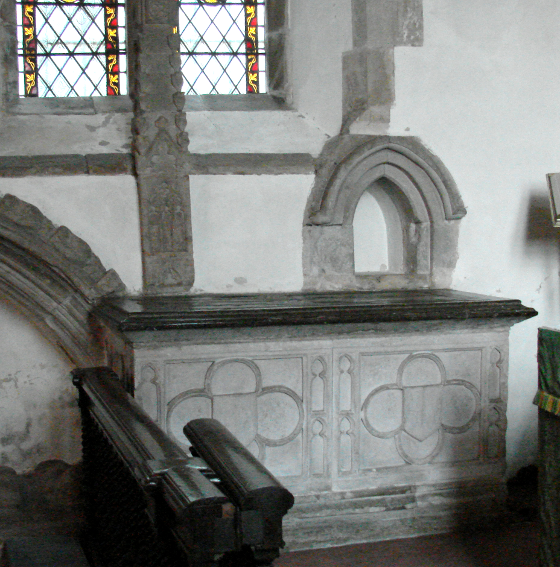 Aumbry: (North chancel) C14 and similar to the piscina (see below) but smaller..
Brasses: (All in the chancel) According to Nibbs (1851 notes) they had been moved from within the sanctuary). 1. Richard de Wakehurst (d1455) and his wives (see also under monuments). There are canopies. They are believed to have been made c1500 (TMBS 10, 5 (1967) p397) and belong to London Workshops, Series F (M Norris: The Memorials p62). 2. Richard and Marjorie Culpeper (d1504). With large canopies and he is armoured. 3. Nicholas (d1510) and Elizabeth Culpeper. He is also armoured and they are shown with their 18 children. The shields retain their original colouring in part. The date of death for Elizabeth remains blank. 4. Elizabeth Culpeper (d1633). This has been attributed to E Marshall on stylistic grounds (TMBS 6, 4 (1944) p46) and is certainly London work. 5. Elizabeth Culpeper (d1634, aged seven). Granddaughter of the last, so the similarities between the brasses are unsurprising. Font: C19.Octagonal, bearing carved texts. 1. (Chancel side-windows) Patterned glass by J Powell and Sons, 1847 (Cash book). The heads of both incorporate possibly C14 heraldic glass; that to the north displays the arms of de Warenne. The glass at the west end is also by Powell’s and of the same date. 2. 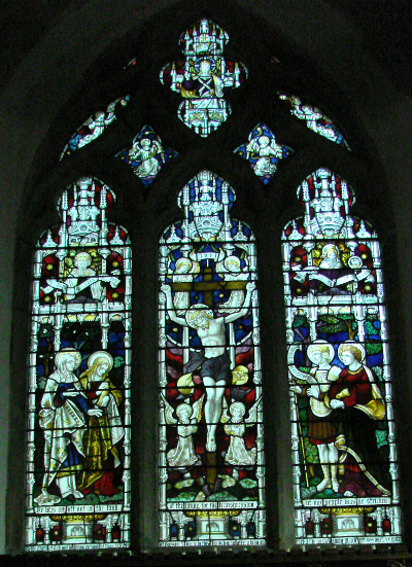 (East window of south aisle) J Hardman and Co, c1874 (www.stainedglassrecords.org retrieved on 28/1/2013). 3. 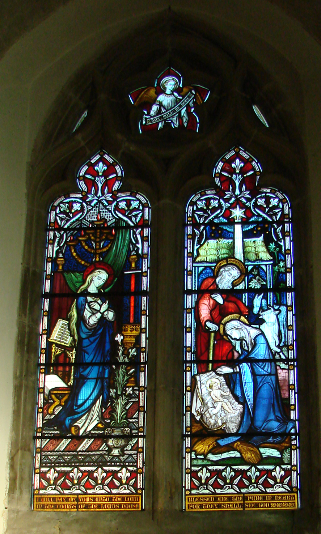 (East window) Clayton and Bell, 1896 (CDG 237 (1913) p66). 2. (North chancel) Richard de Wakehurst (d 1455) and two wives. Tomb chest with large quatrefoils on the sides. On the top are two brasses (see above). 3. (South aisle, wall mounted) Ann Forster (d1591) Iron tomb slab, which is incomplete and may not have been intended for this purpose (Llewellyn p17). 4. (South aisle) Joseph (d1844) and Maria (d1848) Peyton by E Gaffin of T and E Gaffin (Roscoe p488). Old fashioned for its date with a sorrowing cherub above the tablet with an inscription. Piscina: (South chancel) C14 moulded and pointed. Pulpit: Oak with pierced, traceried sides. c1894 by H Hems (BN 66 p555). Reredos: Panelled oak by L K Hett, 1913 (CDG NS 73 (1927) p171). Screen: (Now in tower) Good C15 work, with narrow lights, each with a crocketed finial in the head. In 1861 it was lying in pieces in the tower (B 19 p771) and in 1888 it was put back at the west end (CDK 1888 pt 2 p141), but was returned to its proper place in 1924 (Meads), before returning to the tower in 1999. Stairs: In the tower, each step made from a piece of oak, cut diagonally across, probably contemporary with the tower itself.